Westminster City Council is the local authority for the City of Westminster in Greater London, England. It is a London borough council and is entitled to be known as a city council, which is a rare distinction in the United Kingdom. The city is divided into 20 wards, each electing three councillors. 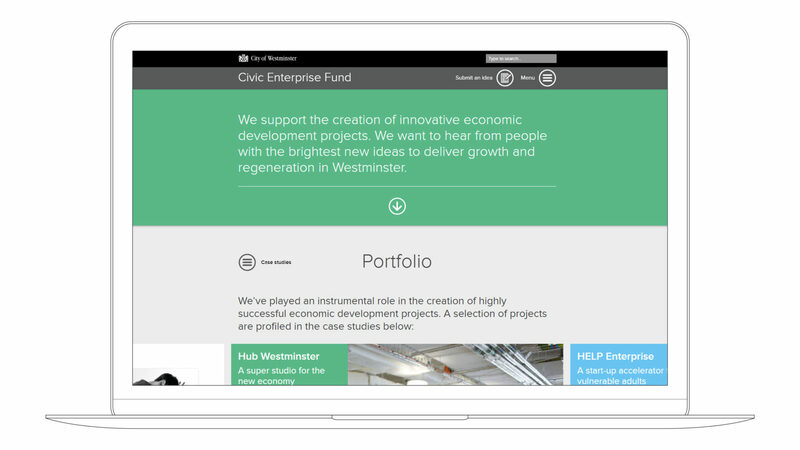 Westminster’s Civic Enterprise Fund is a social investment programme, with the objective of supporting innovative economic development within the City of Westminster. Seeking to be a user-friendly partner for social entrepreneurs, investors and innovators, the Fund reaches out to those who need funding in order to help them contribute to the dynamic economy of Westminster. 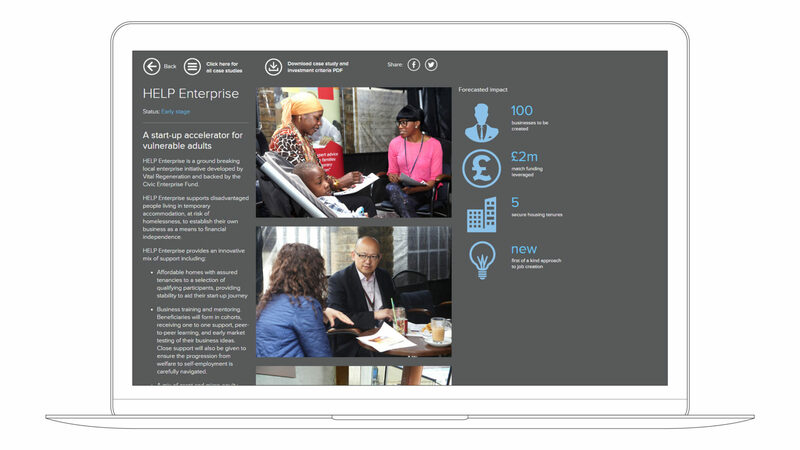 Our commission was to create an informative and engaging website to appeal both to those seeking funding and to potential funders, encouraging individuals and enterprises who were less familiar with raising capital but had potential for growth and innovation. The disparate target audience needs had to be addressed by the content and design of the site. 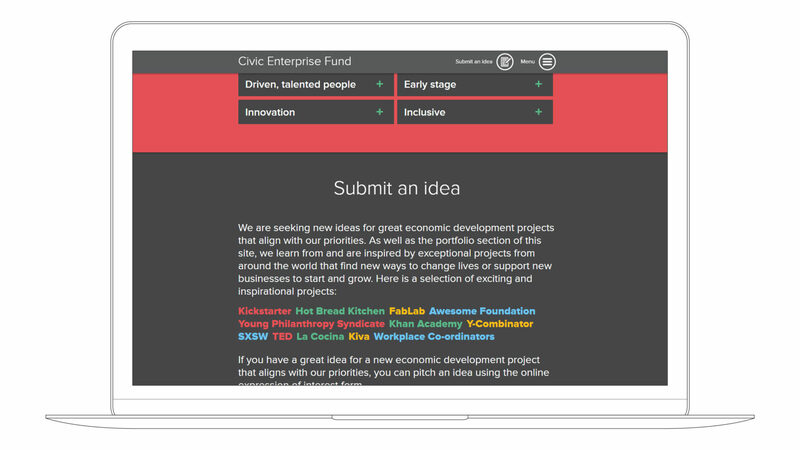 As it developed, the website was required to become a showcase for successful funded projects. While content had been largely prepared by our client, they looked to us to drive the way in which the information should be structured and communicated. 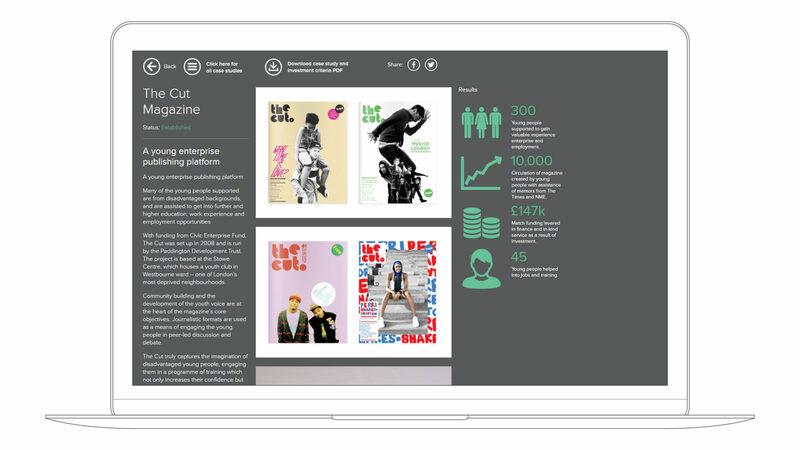 Like them we wanted to create a fresh, dynamic look and feel and an accessible user experience. Together we identified the specific requirements of each user group and developed wireframes that allowed for navigation and content to be fine-tuned. We also created a distinctive identity for the site including colour, imagery, typography and infographic style. Once we had working concepts we subjected these to rigorous user testing, with the feedback we received helping to enhance the site’s usability. Components such as a carefully designed application form system enabled requests to be processed with the minimum of administrative time and effort. 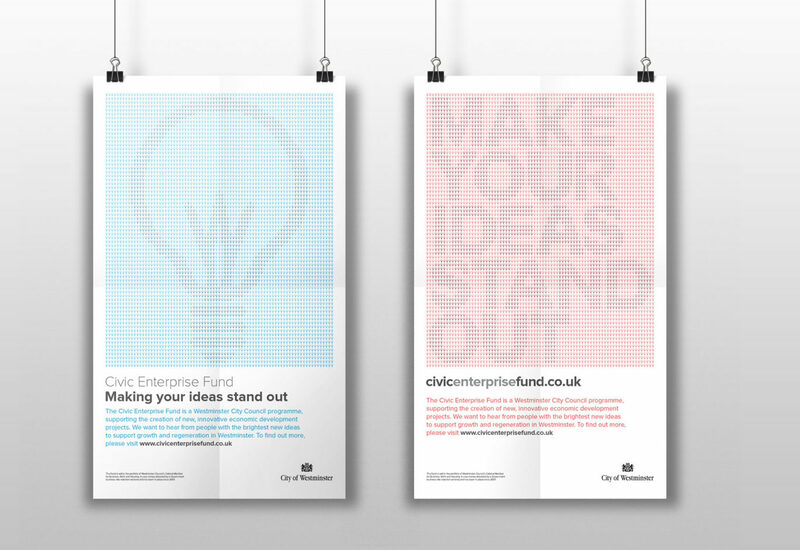 To support to digital initiative we designed posters promoting the Fund in the Council’s entrance foyer. The City of Westminster deemed the site to be a resounding success, as it fulfilled its purpose rapidly by attracting many high quality submissions from funders and those seeking funding. As a result of its effectiveness the site is currently closed to further applicants. Mission accomplished. 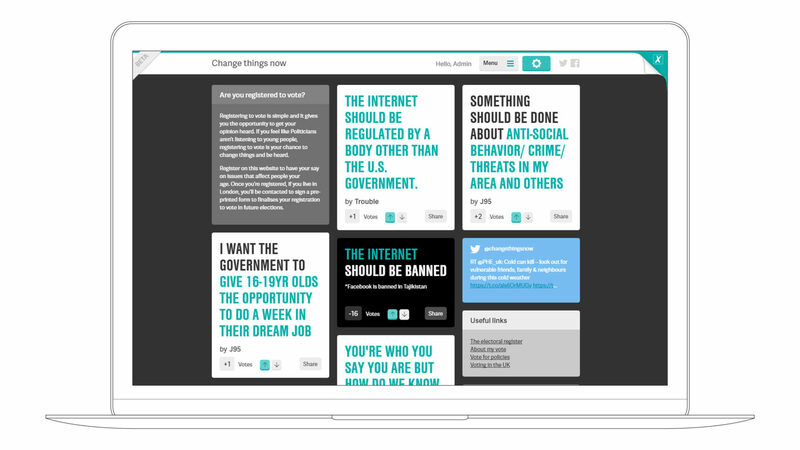 In order to encourage young people in London boroughs to register on the electoral role, the Cabinet Office sponsored a cross-media campaign, entitled ‘Change Things Now’. Research had shown that many in the 18-24 age group had become disengaged with the democratic act of voting, especially as registration was not available online. The programme was managed by Westminster City Council, in conjunction with the Boroughs of Lambeth and Lewisham. The campaign material was then made available for use by all London boroughs. 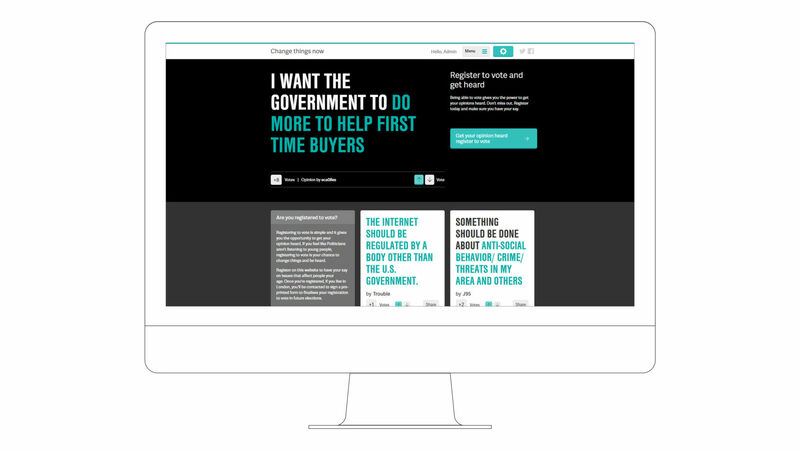 At the heart of the campaign was a website which we conceived to help young people engage with issues they felt strongly about and to enable canvassers to complete registration face to face. The site was designed specifically with a young audience in mind, so it was direct, approachable and mobile friendly. 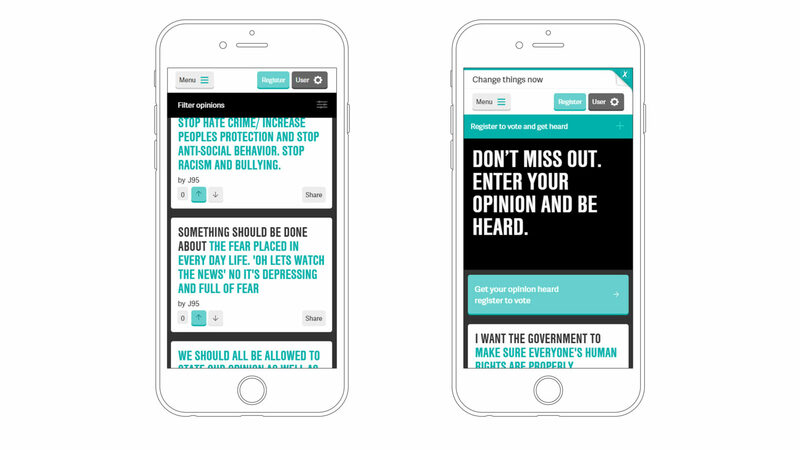 The site embedded videos, carried live opinions from young people and adopted an upfront challenge to ‘make your voice heard’. The nature of the project meant that coordination between the various stakeholders was vital, and agreement on both core content and tone of voice was achieved across campaign material, both online and in print. The site’s ready usability by tech-savvy, but often politically disengaged, respondents was critically important, so testing took place before launch to ensure optimal functionality. The project was delivered to a tight deadline: six weeks from brief to a live, fully functioning site. The campaign had ambitious targets for recruiting new voters. In the event over 17,000 new voters were signed up within two weeks. The project was deemed so successful that once targets had been reached the site was closed. Job done.